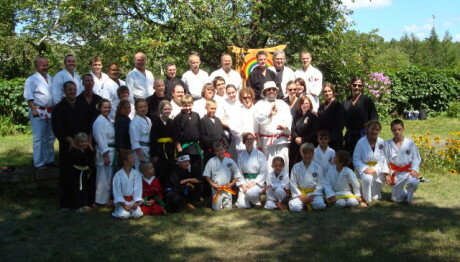 Sudbury School of Martial Arts maintains a progressive attitude in training while keeping with the positive morals and values of studying the traditional arts. We are the only certified school in Canada currently teaching the Filipino Martial Art of Presas Arnis under the guidance of Datu Tim Hartman. Our instructors uphold a high level of commitment towards the personal improvement of their students. Our instructors emphasize a positive training environment that helps a person grow in many facets of life. Through training, our students will develop a healthy body, alert mind, increased energy and above all confidence that will be noticed by yourself as well as others..
Sudbury School of Martial Arts maintains an open attitude towards all styles of martial arts and martial artists. Our philosophy is to maintain an open mind and realize that you can learn something from martial art practitioners of any style or system. Sudbury School of Martial Arts is the only certified school in Canada currently teaching the Filipino Martial Arts of Presas Arnis which core comprises of Modern Arnis and Kombatan along with components of Balintawak , Kuntaw and Bando. Presas Arnis is a modern, effective and dynamic system constantly evolving and improving by being open to influences and ideas from around the globe. The training in Presas Arnis is multi faceted making it a very well rounded system as in encompasses aspects from all the different combat arts. Training at our school will have a huge weapons component such as single and double sticks, knife, staff and stick & dagger. The empty hand aspect of the system involves aspects of striking, kicking, locking, trapping and grappling. 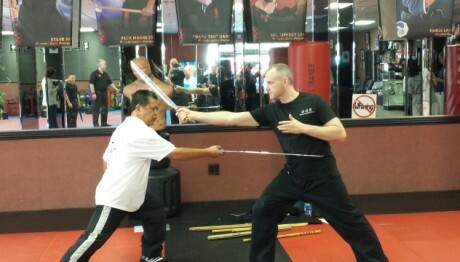 The core of the classes involves partner drills which develop sensitivity, timing and reaction. These drills are then tested by sparring on a regular basis. The children’s program is designed for children ranging from 7 to 12 years old. The classes are very dynamic and quick paced with an emphasis on positive encouragement. The students are exposed to training that will help them improve their strength, coordination, concentration and self-esteem. The children’s program at SSOMA has a well rounded curriculum which encompasses empty hand & weapons training, self-defence, mat work and sparring . Our highly energetic and unique kickboxing classes will elevate your fitness to a new level. We understand that starting a new program can be intimidating especially if you are uncoordinated and out of shape. Our classes are put together in an easy to follow fashion that keeps techniques simple for beginners, challenges our intermediate students and pushes the elite. As you become more comfortable with your techniques and your fitness level increases, you will push yourself harder which creates an intense workout for all fitness levels. Studies done comparing calorie burning activities puts kickboxing at the top. It’s a total body workout. Whether you’re punching or kicking, slipping or weaving, each movement requires the entire body. As you improve your technique you engage more muscles resulting in a complete body workout. Staying motivated should never be harder than the workout. As a student you will find yourself focused on honing and improving you skills. By engaging your mental faculties and becoming focused on learning and refining your techniques, you’ll become highly motivated to attend classes to keep yourself clean and sharp.